Those who live in the East Bay, you will meet at the Ed Roberts Campus at 5 p.m. Then as a group, everyone will take BART to head over to the Exploratorium. For those on the other side of the Bay Bridge, you will meet Tom Shankle (can also be reached by cell phone at (415) 205-3882), the event organizer, in front of the Exploratorium by 6 p.m. The museum is open until 10 p.m. on this evening. Though we've written about these events in the past couple of weeks, we thought it might be a good idea to send out a reminder as there are some important and fun events taking place this week. On Thursday, April 20th, Santa Clara Valley Medical Center is hosting its Spring BBQ for the SCI community-at-large from 6:30-8:30 p.m. The free event will be held at the 1 Rehab Center’s courtyard located in the SCI rehab center at 751 S. Bascom Ave. in San Jose. You must RSVP by Tuesday, April 18th and here's how. Also on Thursday April 20th, the Sacramento Spinal Foundation is hosting a live webinar on Sexuality, Fertility and SCI. 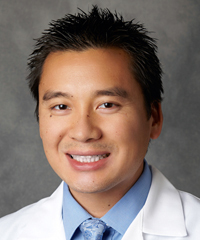 The session features Dr. Ryan Doan from the Physical Medicine & Rehabilitation dept. at the Kaiser Vallejo. You must register in advance and here's where to get information to view the webinar. On Sunday, April 23rd from 8 a.m. to 5 p.m., BORP (Bay Area Outreach and Recreation Program) is hosting its annual Bay Area Adaptive SportsFest in Berkeley. The event features adaptive and accessible cycling, kayaking or rock climbing. They provide all the equipment, staffing and fun you can handle in one day and here's where you can get more information. Every year, the Placerville Mobility Support Group hosts Hangtown Cranker Classic, a handcycle and bicycle ride for the disabled and able-bodied persons. The event is typically hosted in late June but event organizers have decided to move the event to October this year due to the persistent warm weather that area experiences during June. The change in the date, however, has had an effect on the group's ability to secure volunteer staffing and equipment and this is where they are putting out a call for help. If you are in a position to assist or provide handcycling gear and equipment, please contact Lynn Murray at (530) 295-7620 (cell) or (530) 295-3842 (home), or by e-mail at lynnmurray2684@att.net. We couldn't help but notice a tweet from the Reeve Foundation on this topic. It's pretty much on every SCI survivor's mind but doesn't get talked about much. The tweet introduced us to Jessica Grono. While she does not have SCI (is a cerebral palsy and breast cancer survivor, teacher and mother), her article truly applies to people of all disabilities and we thought you might enjoy reading it. Among the many challenges a new SCI survivor often faces is the lack of individuals they can speak with who have been in their shoes and experienced what life with a spinal cord injury is all about. This applies especially to those individuals who live away from population centers and do not have much access or exposure to support groups in their area. Enter the Reeve Foundation's Peer & Family Support Group program. They offer free peer mentoring to people living with paralysis, their family members, and caregivers. Whether you are newly paralyzed, have been living with paralysis for years, or are a family member or caregiver, their peer mentors will provide answers and support, share what they have learned, and help you overcome challenges. They work to match you with the right person by considering age, gender, cause of paralysis, level of injury, ethnicity, veteran status, interests, and where you live. The mentors have been fully vetted and trained by the Foundation and the program is completely free for users. To learn more about this program, please check out their site. New Mobility magazine's April edition featured a lengthy column on several accessible Great American Getaways and Ashley was featured in two articles about Sequoia and Kings Canyon National Parks as well as Santa Cruz. We've all come across them ... that so-called accessible bathroom, the not-so-wheelchair-friendly restaurant, etc. Thanks to the Sonoma County SCI Support Group, you will now have a chance to ask a couple of experts at their Monday, April 17th meeting how to navigate your way around the legal requirements of the Americans with Disabilities Act (ADA). The meeting features HolLynn D’Lil, a disability-rights advocate for the last forty years, who has played a major role in shaping California accessibility standards, including the first California Building Code standards for accessible public accommodations, historical buildings and housing. Also speaking is Richard Skaff, Executive Director of Designing Accessible Communities. He founded the Marin Center for Independent Living, worked as ADA coordinator for the Department of Public Works and then worked as deputy director of San Francisco Mayor’s Office on Disability. Together, they will share their work on building codes and access standards: what the standards are, the relationship of the California code and the ADA standards, what steps you can take to address code violations, and similar areas of interest in the architectural landscape. There will be time for Q&A as well. The meeting is from 4-5:30 p.m. at The Clubhouse at the Azure Apartment Complex, 7 Indigo Drive, Petaluma. For more information, contact Stan Kosloski at (860) 614-8351 or by e-mail at stankosloski@gmail.com. The Risk and Resilience Lab at Palo Alto University is working with the United States Geological Survey (USGS) on a project to better inform citizens about earthquake preparedness. They will be at the Thursday, April 13th Berkeley Spinal Network's meeting so that you can provide input on earthquake readiness and safety materials. The study takes approximately 90 minutes to complete. Only in-person participants qualify for the $20 Target Gift Card that would be awarded. You must be 18+ years of age and identify with having a lifelong mobility impairment. The meeting starts at 6 p.m. Individuals interested must notify Tom Shankle by e-mail of their attendance at tom@everydayabilities.org. Thanks to the folks at SCI Connections program at Santa Clara Valley Medical Center, a "hello spring, you were missed" BBQ will be held on Thursday, April 20th from 6:30-8:30 p.m. The free event will be held at the 1 Rehab Center's courtyard located in the SCI rehab center at 751 S. Bascom Ave. in San Jose. Bring your friends and family. Food will be provided but you must RSVP by no later than Tuesday, April 18th to ensure adequate supply of food and beverages. To do so, contact Robert Medel by phone at (408) 885-2397 or e-mail at vmcpeersupport@scvmcrehab.org. PNP Blogger, Franklin Elieh, attended the Make-A-Thon in Berkeley on March 18th and was amazed with the spirit of the several dozen engineering volunteers working as teams to solve challenges posed to them by the disabled community. You can sense the amount of energy these youngsters were exuding the moment you entered the facility. As previously reported by PNP, Drew McPherson, a C-6 quadriplegic mechanical engineering student at UC Berkeley, has worked with other engineering students for the past three years to create a club focused on developing assistive devices after seeing so many useless projects be built. Though the event benefits individuals with any type of disability, I managed to meet a few who had spinal cord injuries and had submitted their request for solutions to their unique challenges. A friend of mine, and current Santa Clara Valley Medical Center SCI peer supporter, Ligia Andrade was in attendance along with her dad. I met Ligia when she was injured about eight years ago in a car accident. She's a C-5 complete injury and has a somewhat limited use of her arms. Her condition prevented her from applying make up and was dependent on her caregiver or one of her sons to hold and position her brushes, pencils, and lipsticks while she would move her face and apply her own makeup flawlessly. The design team assigned to her developed a nifty Makeup Applicator that holds all the applicators she uses and for the first time since her injury, Ligia was able to independently apply her own makeup. I also met Rafe Biggs, another quadriplegic as a result of a fall some 10 years ago. Rafe uses a wireless leg bag emptier to manage his leg bag drainage and in his own words, it's not a reliable system. His design team developed sensors that were attached to the bag and communicated with Rafe's iPhone that allowed him to use an app to keep track of the last time the bag was emptied and how full it was in real time. This allowed him to avoid any overfills and backups as well as timely emptying of his leg bag. This event's origin comes from TOM:Tikkun Olam Makers (tomglobal.org) , an organization that seeks to address neglected challenges and develop millions of affordable technological solutions for people with disabilities around the globe. It helped support TOM:Berkeley (berkeley.tomglobal.org), a local community for student makers, designers, developers and engineers working together with people with disabilities to develop technological solutions for everyday challenges. This event is co-organized by the student group EnableTech at UC Berkeley, who will provide support for projects to continue after the event. 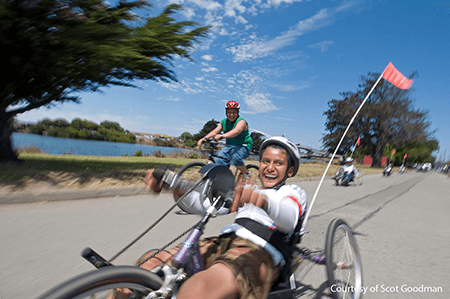 Bay Area Outreach and Recreation Program (BORP) is arguably the premier center for adaptive cycling riders and is now open Tuesday & Thursday from 1-7 p.m. and Saturday from 9 a.m.-3 p.m. (weather-permitting) for all to enjoy this exhilarating activity. 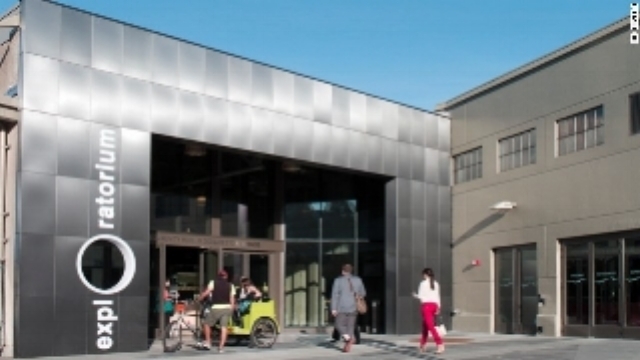 BORP’s Adaptive Cycling Center in Berkeley has the country’s largest and most diverse collection of cycles (over 80) for use by people with physical disabilities. BORP offers orientation and training to new riders, independent use of the cycles, and group rides. Once you have been trained, you can BORP's cycles and ride independently or with friends on over 40 miles of Bike Trails right from the Center. This is one of those fun events that you don't want to miss if you're into (or have wanted to try) cycling, kayaking or rock climbing -- ALL ADAPTIVE AND ACCESSIBLE. It is held every year by BORP (Bay Area Outreach and Recreation Program) and this year's April 23rd event will be from 8 a.m. to 5 p.m. at the BORP Cycling Center, 80 Bolivar Dr., Berkeley. You can learn more about the event and register HERE. Thanks to a generous donation from the Monterey Bay Aquarium’s “Free to Learn” program, tickets are offered for this adventure free of charge on Sunday, April 2. Enjoy a day at one of the largest and most respected aquariums in the world! The aquarium holds 35,000 plants and animals, representing 550 species. Learn about the amazing wildlife living in the nearby coast and ocean, such as seahorses, otters, sharks, jellyfish, and more! The aquarium also offers dozens of educational shows and activities included with your admission. “Free to Learn” has partnered with the Monterey Salinas Transit System to provide a complimentary bus ride to the Aquarium from the Santa Cruz Metro Center! Limited space available and tickets will go fast. Sign up by contacting Shared Adventures at (831) 459-7210 or via e-mail at activities@sharedadventures.org. 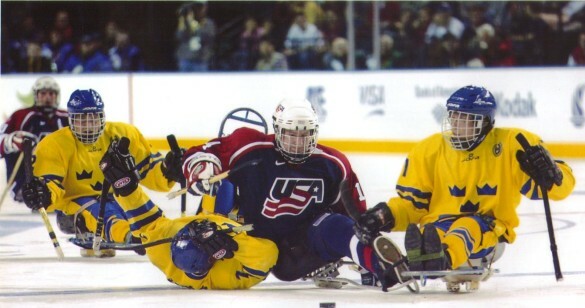 USA Hockey and the Pacific District will host the 13th Annual Disabled Hockey Festival from April 6-9 in San Jose. The Festival offers a fun and exciting weekend of hockey in a grand event as well as promote and grow disabled hockey throughout the country. It is the largest disabled hockey event of its kind with 64 teams from throughout the country participating. Get all the details at http://www.usahockey.com/2017festivalinfo. This year, the Festival will take place at Solar4America Ice, 1500 S. Tenth St. in San Jose. This is the official practice facility of the NHL's San Jose Sharks. It is the largest hockey facility in the western United States, featuring 4 NHL- sized rinks. Individual players may still register to participate by completing this form. Registration is $35 per person. The Festival Committee will do their best to find a team for you to play with. For additional information, please contact Kellie Hays at kelliemhays@gmail.com or (541) 954-5644. Knowing your accessible air travel during the busy spring & summer travel seasons can save you a great deal of time and grief. It’s a busy time of year for travel planners as many people get off the grid for some fun in the sun. As you might expect, wheelchair users and other people with disabilities have a little more travel preparation to consider than the average jet setter. Air travel can be downright frustrating, especially if you have mobility equipment and require special accommodations. United Spinal Association’s Accessible Air Travel booklet provides a good starting point to a hassle-free experience at the airport. After all, vacations are supposed to give you a break from the stress, not cause more of it. So, make sure you know your rights! Download the free guide. Fremont-based Asterias Biotherapeutics announced last week that the sixth and final SCI patient in its current phase 1/2a trial has also experienced motor function improvements at six months following administration of the company's embryonic stem cell therapy AST-OPC1. The patients enrolled at this stage of the clinical trial, all quadriplegics, received a dose of 10 million cells within 14-30 days following their injury. Six medical centers in the U.S., including San Jose-based Santa Clara Valley Medical Center, are participating in these trials. The company is moving forward with plans to expand that to 12 facilities that would enroll up to 35 patients as the trials advances to the next stage that involves dose of 20 million cells. PNP blogger, Nick Struthers, went along to the first Support Group Meeting in San Lorenzo hosted by Arthur Renowitzky, founder of Life Goes On Foundation. Arthur expects to meet monthly at the San Lorenzo Library which is located at 395 Paseo Grande, San Lorenzo. As myself and Kevin arrived in the parking lot, we realized that the meeting would be held in the library. The modern library building is the perfect venue, easily accessible with the latest amenities. The spacious conference room had the latest technology video displays and sound system which was perfect for the multi media presentation that Arthur delivered. This was the first time I had met Arthur and he was every bit as charming and engaging as his appearances on numerous TV interviews had suggested. The bulk of the audience were young enthusiastic volunteers who were keen to engage with the Foundation's work. Just go to the web site's calendar to see when the next meetings are scheduled. PNP wishes Arthur all the best in this exciting initiative and encourage anyone in the area to get involved. Look out for an interview with Arthur on PNP soon as he'll discuss his work with the Life Goes On Foundation. Even though we've got some time before the annual fundraising event of Disability Services & Legal Center, we thought it might be a good idea to let you know some of the early details of this Friday, June 9th event. DSLC operates as a non-profit organization dedicated to enhancing the lives and advancing the rights of people with disabilities in Sonoma, Napa, Lake and Mendocino counties. Click on the poster below for additional details.